This edition of Graphic Intelligence shows wages and wage increases for occupations in Canada by age group. Wages tend to rise over the course of working life. Wage levels and increases, however, differ depending on occupation and the age of employees. Wages in some occupations continue to grow throughout a person’s career while some other occupations show little to no earnings progression with age. Wages in jobs such as managerial and some professional occupations increase to more than double by the end of a person’s career. 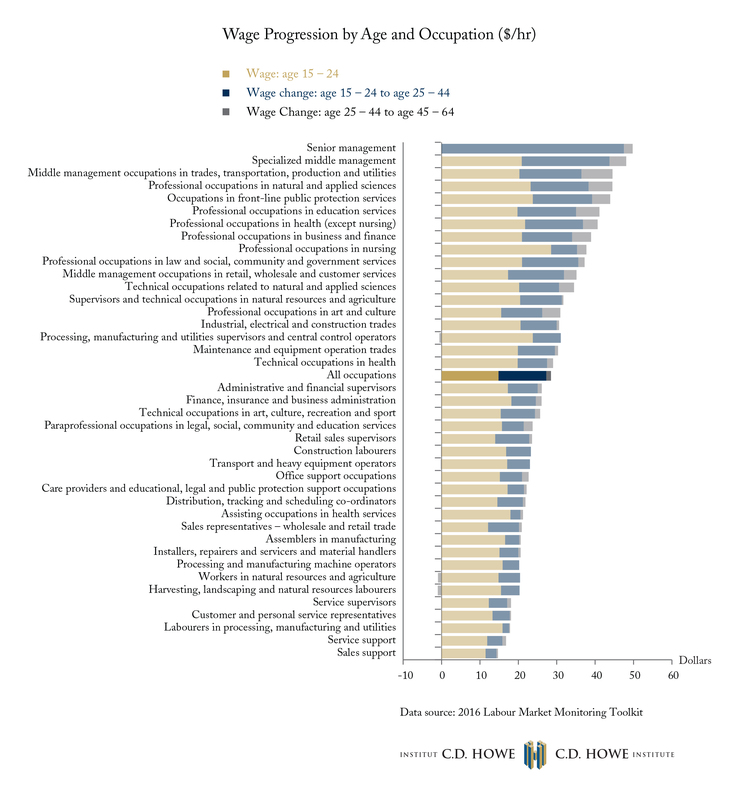 Some occupations barely increase wages as workers gain experience with age. For example, the wage for the average 15-24-year-old labourer in processing, manufacturing and utilities is only about $2/hour lower than a 60 year old with the same job. Wages in some physically intensive occupations actually decline as workers enter the later stage of their careers (natural resources labourers; construction labourers; and manufacturing supervisors). Generally, occupations with larger wage increases are those that require at least some post-secondary education. This relationship highlights the returns to investment in education and skills. Acquiring post-secondary training requires the investment of time and money in the form of forgone wages and tuition fees. This investment, however, shows returns in the form of higher wage levels and larger increases over the course of a person’s career. To learn more about the return on post-secondary education, read “The Payoff: Returns to University, College and Trades Education in Canada, 1980 to 2005,” by Daniel Boothby and Torben Drewes.